Alison Woolf. Images courtesy David Wakely. Interior design is not some cakewalk that entails merely playing with Pantone colors and oil-rubbed-bronze finishes, followed by four-course lunches with clients. 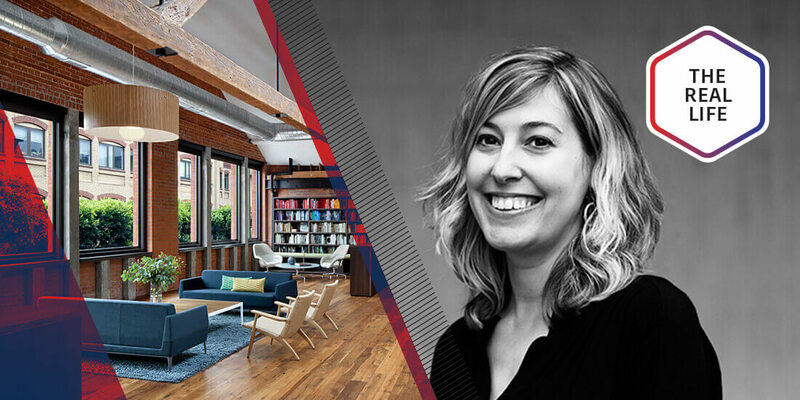 The role has many challenging aspects, as Alison Woolf, senior associate at Huntsman Architectural Group, can well attest. The life of an interior designer includes—but is not limited to—dealing with lawyers who are skilled at interrogation and question every design decision; unrealistic and hectic schedules; complete shifts in direction at the 11th hour; and oppositional goals, such as creating a wide-open, beautiful space with iron-clad security. But yes, there’s also creativity, collaboration, and color. Woolf has spent more than 15 years of her career at Huntsman, working on projects for Dolby Laboratories, Forbes, Google, the Netherlands Consulate, and technology law firm Fenwick & West. Here, she explains her process of collaborating with colleagues and clients, maintaining decorum in difficult situations, and unraveling the riddle of what makes companies tick. Tolleson lounge in San Francisco. Courtesy David Wakely. Probably the Tolleson offices. 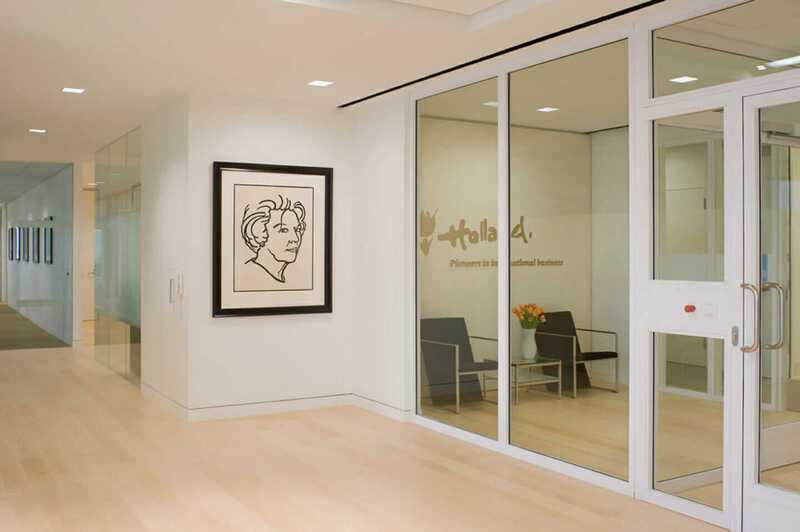 They’re a creative agency in San Francisco focusing on companies’ brands. It was a great project because we moved them into a historic brick and timber building in Jackson Square that we gutted and renovated. The best thing about working with them is, they are also experts in a creative field, so there are a lot of parallels with how we both work. 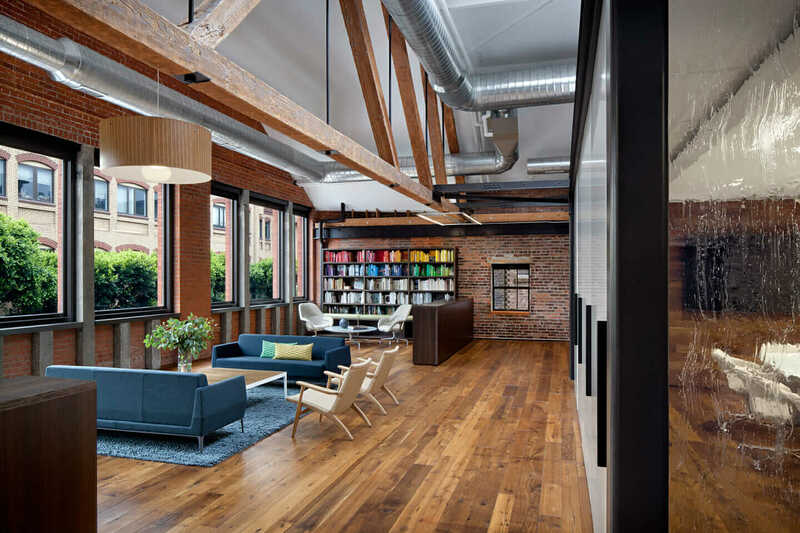 They have brainstorming sessions, they do charrettes, they’re looking at color and context, and they prepare and present these ideas to clients. In a way, designing for them was how I’d like to design a space for myself. You worked on a team of four for that project. How did you collaborate? The team included a design principal; I was the lead designer; and we had a junior designer who did drafting, worked with vendors, and helped to select lighting and finishes. First, we formulated the goals and design concept together with the client. Then, our team began space planning and considering the space three-dimensionally. At that time, our project architect came onboard. He helped to detail the new loft, staircase, and skylights. He also took the lead on the construction administration part of the project. At Huntsman, we work closely together to make sure the project is cohesive. There are items that would naturally fall into my category, like directing the overall design concept and setting the direction of the finishes. There are other tasks that would fall into the architectural side, like code research or door and hardware schedules. We each have our roles, but there’s a lot of overlap in our experience and knowledge that lends itself to working together as a team. Netherlands Consulate General lobby in San Francisco. Courtesy Sharon Risedorph. You worked on the the Netherlands Consulate General in San Francisco, which called for an open and airy design that also integrates high-security features. How did you manage that? We did our best to keep a lot of the security features hidden. We incorporated bulletproof glass, but we kept the framing system very clean. We also designed air-lock entrances, which had to be visible by nature, but most of the security measures were hidden between walls, floors, and ceilings. 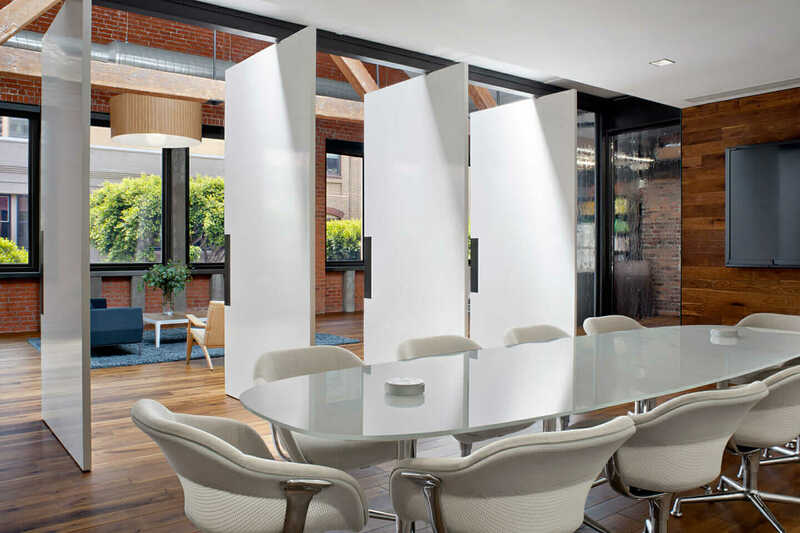 We incorporated glass-fronted offices and clerestories, as well as retractable conference doors to allow the space to feel open. The suite had beautiful views that you could appreciate from almost anywhere in the office. What’s your process working with clients? First, we try to get the client into a room, get everybody to turn off their cell phones, and focus on the goals of the project. We’ll talk about the client’s typical day-to-day routine. We’ll discuss their website and current branding. Then, we’ll talk about what the first impression should be as you walk into the space. Are they a casual place? Are they sophisticated? Are they young, fun, and techy? We try to nail down what sets them apart from their competition—culturally and businesswise. And from understanding what makes them tick, we create a space that reflects who they are. Tolleson conference room in San Francisco. Courtesy David Wakely. Sometimes, they’ll bring their marketing people in to comment on the direction of their brand and image. On the other hand, a few clients have said, “You guys pick our color palette because we’re really not sure what that should be.” That’s fun, when we get to select their corporate colors for them. During schematics, we consider the parameters—or what we like to think of as “opportunities”—of their space and incorporate their program and goals to create a few space plans. Oftentimes, there’s one that’s easily agreed upon. We proceed into the design-development phase from there. The biggest hurdle is when a client switches gears late in the process. Occasionally, after a project has been fully designed, the client will ask us to make a big change. It can be difficult when a change is made that late in the game to keep a strong design concept intact, especially if they request a big shift in the space plan. This can end up delaying the schedule and costing money, but beyond that, it can be deflating for the design team. You try not to be too emotionally involved, but you just are. You have to step away from what you’ve put your heart into and say, “Okay, this is what the client wants.” You need to reassess, salvage what you can, drum up the energy to brush yourself off, and keep going in a new direction. You have to make the best of it. And sometimes the new direction gives us an opportunity to make changes that will make the project better in the end. Netherlands Consulate General air lock in San Francisco. Courtesy Sharon Risedorph. How have you managed difficult situations with clients? There’s a client I worked with who was the son of a well-respected architect, although he was not an architect himself. He wanted to be involved in the design process, which is something that we welcomed, but there was a point when I realized he was going to question everything and make us spell out every decision.